90% of property market searches are being done online, this is a hint for sellers and developers alike. 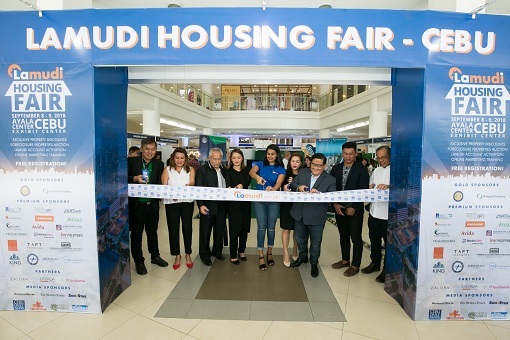 At the recently concluded two-day Lamudi Housing Fair held at the Ayala Center Cebu last September 8 and 9, 2018 gathers property developers, brokers, bank representatives, and buyers, led by Lamudi Managing Director and CEO Bhavna Suresh Chathambeth also in the ribbon cutting ceremony on the first day. (L-R) Atty. Nelson Chua (PAREB-CESOREB, President), Lucylyn Whysall (PAREB-CEREB, President), Herbert Buot (CREBA, Chapter President), IDr. Sharon Bering (PIID Cebu, VP for Internal) Bhavna Suresh, Shaleena Dee (Ortigas & Company, Corporate Sales Manager), Robert Leyretana (LRA, Deputy Administrator), Ryan Mantuhac (PIID Cebu, President), and Atty. Marlo Cugtas (Register of Deeds, Cebu City). 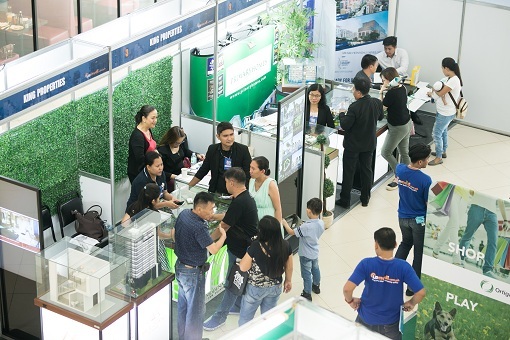 Project developers and other exhibitors anchored the Cebu Housing Fair and each had their own expertise, projects, and products to showcase to those in attendance. Experience Ortigas & Company their model units onsite using virtual reality (VR) technology. Titling tips and services imparted by the Land Registration Authority. Banks such as RCBC Savings Bank offered housing loan products while UnionBank actively held an auction. Brokers who wanted to expand their presence in the industry had Keller Williams Philippines to consult. This was complemented by PAREB-CESOREB, whose Cebu real estate broker membership has been growing since 2015. Megaworld and Robinsons Land being the most active developers in the country already staked out Mactan through their respective projects, Mactan Newtown and Amisa. Ayala Land had its Amaia arm present the Amaia Steps development while Avida offered special discounts for its Riala project. Quadruple A contractor DMCI also went all out in marketing its Pasig-based Satori Residences and had hopes of having their first Cebu property soon. Property seekers visit the booths present at the Lamudi housing fair. Homegrown developers Gaisano-led Taft Properties partnered with world-class development group Hong Kong Land to create Mandani Bay, a beautiful waterfront township project. King Properties presented their home office concept Meridian, set to be located within Cebu City’s Golden Triangle. Primary Homes also had visitors considering its award-winning condo development, Brentwood in Lapu-Lapu City. Other Cebu-based property developers were Softouch Property Development Corp., AboitizLand, Inc., Contempo Property Holdings and RDAK Land, Inc. Event sponsors such as Food Panda, Zalora, and Lazada also made the event more engaging for the attendees. 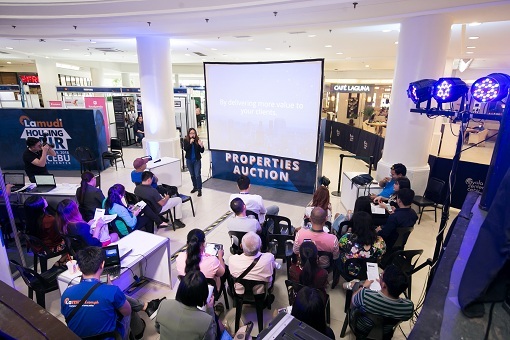 UnionBank’s Asset Recovery Group headed by UnionBank Vice President Edzel Babas energize the mood and gave a short background talk on the team’s role, as well as the auction procedures. The special auction’s pace was systematic: items sold fast as each went to sole bidders in a matter of seconds. All properties that were bid upon were purchased at their indicative prices. UnionBank also gave special discounts to successful bidders. Real estate brokers and agents participated in a free onsite online marketing seminar. It's Unionbanks's fifth Lamudi event and turned out to be successful too. Mr. Babas shared that Unionbank were able to dispose of a total of 27 properties, he also commended the partnership with Lamudi as the number one online portal in selling properties and very happy about the partnership. Lamudi’s Senior Account Manager for Visayas and Mindanao Jeff Canonigo shared some insights on Cebu’s property market. According to him, pre-selling properties would quickly get sold out, especially those coming from local developers. He also noted that Cebu Business Park is the city’s rental condominium hotspot. Lamudi heads the pack in its industry as the leading online real estate platform. It has grown from 2014 to now 2018 which has 1.5 million website visits every month delivering over 100,000 monthly leads for its subscribers. Its new Lead Management tool only makes selling much easier for brokers, property developers, and owners alike. New subscribers are welcome by the Lamudi team and brief with the process at the event. Online marketing courses were also provided by the Lamudi Academy for the 2-day Housing Fair. Converting online leads to sales , Delivering excellent customer service and Top channels to use online are some of the classes delivered by Lamudi’s Learning and Development Coach Nadine Pacis. The great turnout of Lamudi’s Cebu Housing Fair signifies Cebu's property market is set out to be one of the country’s next real estate center. An insight to look for are influx of waterfront developments that has the potential to raise property values in the metro and even brighter prospects for City’s progress. 0 comments: on "Lamudi Housing Fair excites Cebu's Booming Real Estate Industry"